Scientific name: Indigofera suffruticosa Family: Leguminosae. Common name: Indigo mutuy cube, Indigo. Botanical Description: Indigo is a sub-shrub with erect stems, compound leaves, leaflets oval, barely pubescent on the underside; inflorescence axillary racemes shorter than the leaves, has small pink flowers and vegetables compressed. It blooms in the months of January and February. Ecological level: the indigo or indigo is typical of tropical America. In Peru distributed along the coast and the Amazon. 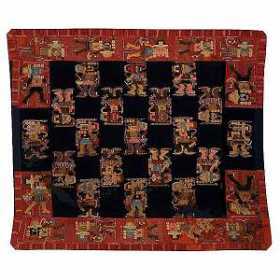 Historical Background: The indigo or indigo was of great importance in pre-Hispanic cultures as Ancon, Tiahuanaco, Wari, Chimu, Chancay and Inca, as the leaves and stems was obtained a dark blue to dye the cotton fibers, used in the making of cloaks, tunics, unkus, loincloths, and so on. Dr. Fortunato Herrera, botanical Cuzco, Peru Florida researcher says that in the province of La Convencion, in Cuzco, is still preserved the memory of indigo cultivation in the past. Note that this plant is from the Amazonian forest, and it is possible that the coastal cultures like Chancay, Chimu Ancon, which obtained through exchanges with people in the forest, and started cultivation on the coast. Uses: It has medicinal uses as it serves as an antidote to scorpion bites, it is also a great antiseptic that heals skin ulcers. It is a valuable blue dye that colors and is known as Indigo, a commercial level. How to dye with indigo? Color: Blue. Material: Collect the leaves of indigo and pound fresh in a fulling mill. Quantity: 5 to 10 kg of indigo and 1 kg of wool or cotton cloth. Dyeing: Put the crushed leaves of indigo in a container with water. The color is darker if added to the solution 20 To 40 g of potassium carbonate. Add the wool or cloth and leave for half day or full day. If you warm the dye comes out better. Remove the wool and wash until the water runs clear. (Encyclopedic Dictionary of Useful Plants of Peru - Antonio Brack). Status of species: Indigo is a shrub that grows wild and cultivated. The potential of dye plants is very large and with high demand. The country is one of the leading exporters of dyes and natural dyes to the world, so it deserves special care and increasing the agricultural frontier in this species.